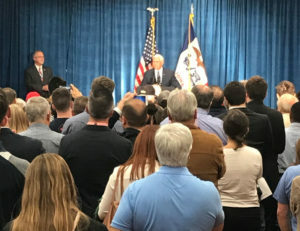 Vice President Mike Pence campaigning in Iowa. Vice President Mike Pence rallied with about 200 of Republican Congressman David Young’s supporters this afternoon in Des Moines. Pence told the crowd the race in Iowa’s third congressional district may determine whether Republicans retain majority control of the U.S. House or Democrats take over. “This race is going to be critical to whether we’re going to be able to continue with the momentum that we have,” Pence said. Pence returned to that theme several times during his 24 minute speech. “The fate of the Republican majority in the House might just go through Iowa 3…It’s a choice between two different futures, one future under a Republican majority in the United States House of Representatives and another future where Nancy Pelosi is speaker of the House again,” Pence said and the crowd booed. Pelosi’s name was mentioned often during the event. Young spoke less than seven minutes and mentioned Pelosi’s name seven times. Pence trumpeted the economy in general and cited Young’s work on veterans issues in making the case for Young’s election, then Pence mentioned Cindy Axne, the Democrat who’s challenging Young’s bid for a third term. Trump said last week in Council Bluffs that a vote for Young was a vote for Trump’s agenda. Pence, in his remarks this afternoon, made the same case. “(Young’s) been there, standing with this president every step of the way,” Pence said. The vice president drew the largest burst of applause when he promised that Trump would withhold aid from Central American countries if a caravan of 4000 asylum seekers from Honduras winds up at the southern border.